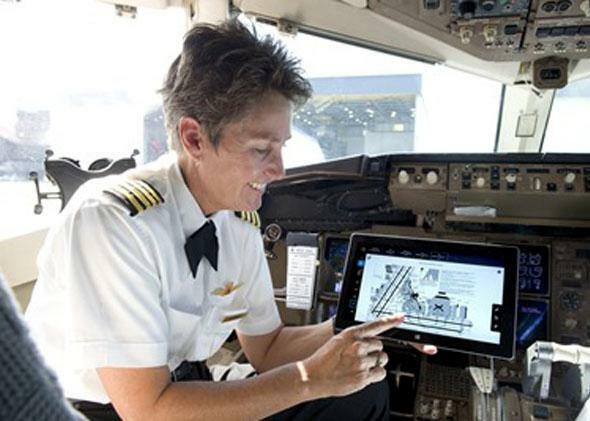 FAA approves Microsoft Surface 2 tablets for pilots to use in U.S. cockpits. A pilot using a Surface tablet in the wild. Photo from the Surface Blog. Plane passengers were finally liberated last year when the FAA ruled that small electronic devices, like tablets and smartphones in airplane mode, are safe to use during takeoff and landing. But pilots were limited to using iPads until the FAA approved the Microsoft Surface 2 yesterday for cockpit use. Though airlines will still have to apply to have their pilots use the Surface 2, or any tablet, devices that have gone through the first part of the process get the green light more easily. This means that pilots will be able to replace the huge paper manuals they’ve been carrying around for decades with “electronic flight bags”—that is, tablets—that can contain full manuals and get regular automatic updates. Ahead of the decision, Delta had already committed to arming 11,000 pilots with Surface 2 tablets. (The Surface Pro 2 is not yet approved). Companies like Delta cite weight reduction as a major motivation for the transition to tablets, because replacing 38-pound paper manuals with 1.5-pound devices could translate into millions of dollars a year in fuel savings. ZDNet reports that Delta’s switch will eliminate the need for 7.5 million sheets of paper a year, and the company’s goal is to have paperless cockpits by the end of 2014. Whether you love Surface 2s or hate them, it can’t hurt to have options. Still, it seems not everyone at Delta is thrilled with the decision. ”We fought hard for iPad,” an anonymous pilot told AppleInsider in September. He complained that Delta made its decision based on money rather than tablet quality, and sniped that the airline’s IT department has historically been “in bed” with Microsoft.